WKU Hilltopper Basketball starts its final road trip before Bonus Play begins at Rice at 8 p.m. Thursday in Houston. The game will air on CBS Sports Network. 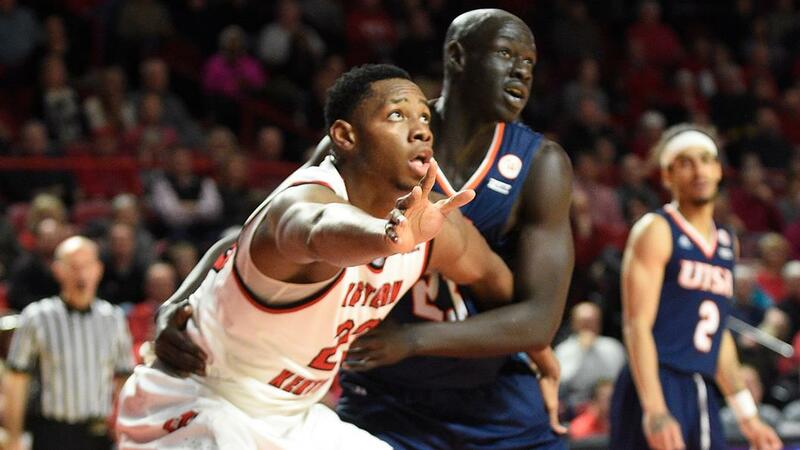 The Hilltoppers have won five of their last six and two straight, most recently topping UTEP 76-59 at home Saturday. WKU will be trying for its 1,000th straight game with a made 3-pointer. Rice is 4-6 in conference play, but 3-2 at home in league action. WKU is 3-2 all-time against the Owls but has won two in a row, including last year in Houston. Hilltopper head coach Rick Stansbury is 2-0 in his career against Rice. WKU freshman center Charles Bassey has more blocks himself (49) this year than 41 Division I teams.As of Tuesday, Charles Bassey was ranked fifth in the nation among freshmen in total blocks (49), third in field-goal percentage (64.5 percent) and second for total rebounds (233). Bassey ranked in the top 50 nationally in double-doubles (16th), field-goal percentage (12th), blocks per game (29th), total blocks (22nd), rebounds per game (16th), offensive rebounds per game (32nd), defensive rebounds per game (26th) and total rebounds (14th). Bassey’s 11 double-doubles this season are the most on record by a Hilltopper freshman. Bassey leads C-USA in double-doubles and is 1 of 2 freshmen in the entire nation averaging a double-double. WKU is trying to become just the fifth team in NCAA history to reach 1,000 straight games with a made 3-pointer. Kentucky was the first program to hit the benchmark on Feb. 11, 2017. The Wildcats’ streak eventually ended at 1,047 games and has since been passed by UNLV. WKU is ranked fourth in the nation among active streaks of consecutive games with a 3-pointer at 999 straight contests. UNLV has the longest streak in history, while Vanderbilt and Duke have also eclipsed 1,000 straight games. Arkansas is on pace to reach the milestone just one game behind the Hilltoppers. WKU’s streak of consecutive games with a 3-pointer began on March 15, 1987, in a second-round NCAA Tournament game against Syracuse. After failing to make a 3-pointer in an opening-round victory over West Virginia, the Hilltoppers’ Kurk Lee sank three 3s against the Orange to start a streak that has lasted nearly 32 years. Getting at least one 3-pointer in every game since 1987 hasn’t always come easy for the Hilltoppers. In fact, they’ve had 19 games during the streak in which they’ve only hit one 3-pointer. Two of those games actually came last season, with both going to the second half before WKU hit its first 3-pointer. The most close calls came in 1987-88 and 1992-93, in which the Hilltoppers netted just one long-range shot in four games both years. WKU had to wait until the final minute to make its first 3-pointer against Denver on Jan. 6, 2011. The Hilltoppers played 39 minutes and 9 seconds before Kahlil McDonald sank the team’s only 3 of the game. There’s no doubt about the most significant 3-pointer in WKU history. In the first round of the 2008 NCAA Tournament, the 12th-seeded Hilltoppers went to overtime with fifth-seeded Drake. With WKU trailing by one, Rogers knocked down a 26-footer for the win in what has become one of the most iconic shots in NCAA Tournament history. The Hilltoppers went on to advance to the Sweet 16 after defeating San Diego in the second round. Rogers’ shot won the ESPY Award that year for Best Finish.